When you order a wood veneer variety pack from us, you can expect it to meet your needs with exactness. Here at Sauers & Company Veneers, we have over 40 years of experience in the wood veneer industry. Today, we offer a varied selection of wood veneer packages designed for a variety of applications, and we are ready and waiting to meet your needs. 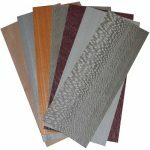 While you can order one of our standard wood veneer variety pack options, you can also place a custom order. After you order a wood veneer variety pack, expect us to ship it within 24 to 48 hours. Beforehand, our friendly staff members are available to answer your questions about our packages and what they include. We founded our business on the principles of quality veneers and excellent customer service, so we are happy to speak with you about your wood veneer needs in-depth. We use the finest veneers available to produce our hobby packs, and the average thickness of the veneers is 0.024 of an inch. They also come in many color combinations, so whatever project you want to complete, we have the options you need. We guarantee the quality of our veneers, so when you order a wood veneer variety pack, you can expect it to meet your needs with exactness. Please don’t hesitate to reach out to us at Sauers & company Veneers if you have any questions about our veneers or want to place an order for a wood veneer variety pack. We look forward to hearing from you and to helping you complete your project with our exceptional veneers! At Sauers & Company Veneers, we create wood veneer variety packs for residents of Anaheim, Los Angeles, and San Francisco, California; Dallas, Texas; New York City; Chicago, Illinois; Boston, Massachusetts; Charlotte, North Carolina; and anywhere else in the United States.